CHAUCHETIÈRE, CLAUDE, Jesuit missionary, mathematician, artist, and mystic; b. at Saint-Porchaire-de-Poitiers in Aquitaine, on 7 Sept. 1645; d. 17 April 1709. When 17 years old Chauchetière was present at the death of a priest who was on the point of departing for the Canadian mission field and said, “that made me feel that it was good to give oneself to God.” He entered the Jesuit novitiate at Bordeaux in 1663 on his 18th birthday. He felt much attracted to Canada because the possibilities for suffering and sacrifice seemed especially great there. He applied himself to his spiritual preparation for such evangelical labours. In spite of his fervour “and his constant desire always to do the will of God” it seemed to him that his spiritual progress was slow and that each day undid the work previously accomplished. From 1665 to 1667 he studied philosophy at Poitiers and then instructed at Tulle, La Rochelle, and Saintes successively. 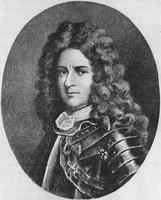 At the end of December 1672, he saw Francois-Joseph Le Mercier* who gave him some lessons in Huron. Chauchetière at this time learned the rosary in Huron and found consolation in praying in that language. He came to Canada in 1677 (some say 1674) and spent one year at the Huron mission at Quebec prior to his assignment to the Iroquois mission, Saint-François-Xavier, at Sault-Saint-Louis (Caughnawaga). His name is found in the registers of La Prairie and Lorette in 1677. In that year Kateri Tekakwitha*, one of the converts at the Mohawk village of Gandawagué, came to Saint-François-Xavier and gave the leadership the new community required. Chauchetière was much impressed by her mystical experiences and her deep spirituality; he had scarcely expected to find such spiritual depth among the native converts. Kateri Tekakwitha lived at the mission of Saint-François-Xavier until her death on 17 April 1680. The following year Father Chauchetière painted a portrait in oils of the Indian maiden and wrote a brief biography of the “lily of the Mohawks.” He attributed to her intercession his seemingly miraculous escape from the mission chapel, which collapsed during a gale. In 1682 Father Chauchetière put his artistic talents to further use. Employing a technique used by Pierron* among the Mohawks a decade earlier, he introduced at the Caughnawaga reserve paintings of biblical scenes and illustrations of the sacraments and of the seven deadly sins. These were bound into small books which the Indians could readily take with them to the fields and forests. His numerous writings are always picturesque and entertaining, as well as instructive. The narrative of 19 years of labour at the Caughnawaga mission is rapid in its pace and permeated with the mysticism of its author. His letters indicate a deep concern for the spiritual and temporal welfare of the Iroquois converts and the 100 or so French families for whom he was pastor from 1678 to 1685. His pamphlet on drunkenness discussed the chief social problem confronting his colleagues who sought to convert and Frenchify the tribesmen. He described such effects of the liquor trade as loss of life and property, sexual deviation, and aggressiveness caused by drunkenness, but he offered no new or effective means of social control. Chauchetière did not enjoy good health. In 1692 he suffered from severe headaches and erysipelas and soon afterwards was weakened by a “bloody flux.” He wrote that during a visit to Fort Frontenac (Cataracoui) he was attacked by scurvy. His eyesight began to fail him during the later years of his ministry but he refused to wear spectacles. In 1694 his 16 years of service as a missionary to the Iroquois of La Prairie ended. On 20 September he wrote to a friend in Bordeaux that he was to have gone with Pierre Le Moyne d’Iberville to Hudson Bay “to teach a class in mathematics on the ship.” He was replaced by Father Silvy, then at the last moment Marest was substituted. Chauchetière then expected to be sent to the Huron mission at Michilimackinac, but instead he was sent to Montreal to teach the boys “navigation, fortification, and other mathematical subjects.” He described his occupation as that of “proto-regent of Villemarie” and teacher of mathematics to 12 or 15 pupils, including some young officers. He reported in 1694 having two or three pupils who were on ships and one who was the assistant pilot of one of the king’s vessels. In addition to teaching mathematics each afternoon from four to five o’clock he was expected to hear confessions on Sundays, and on the first Sunday of the month he was required to preach in the parish church. The latter duty he does not seem to have relished and he commented, “I must preach but I have no sermons.” He had always been much interested in scientific concepts, as his correspondence and relations reveal, and he took care to observe carefully and to record eclipses, parhelions, earthquakes, and other natural phenomena. His descriptions of the fauna and flora are vivid. Chauchetière’s ministry at Montreal was hardly a peaceful one. He shared the Jesuits’ suspicion of the Sulpicians who were influential on the island. He had many confrontations with Bishop Saint-Vallier [La Croix], who on more than one occasion threatened him with interdiction. 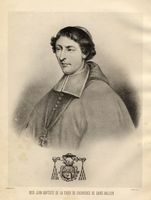 Chauchetière found his position made more difficult by the fact that he was confessor to Governor Callière of Montreal, a bitter enemy of the bishop. When Chauchetière was so bold as to object to the numerous restrictions and reserved cases imposed by Saint-Vallier, the bishop questioned both the missionary’s motives and his moral integrity. Little is known concerning the later life of Chauchetière except that he remained faithful to his calling until his death at Quebec on 17 April 1709. ASJ France (Chantilly), Fonds Brotier, 162, ff.78–889 108–20. ASJCF, Collection générale, Série A, ff.VIII(b), XI(a), 1, 5; XI(b); XII(A) (PAC, FM 17, 6–3); 343. Charlevoix, History (Shea), IV, 283. Claude Chauchetière, Narration annuelle de la Mission du Sault depuis la fondation jusqu’à l’an 1686; La vie de la b. Catherine Thegakouita dite à présent la Sainte Sauvagesse (Manate [New York], 1887). JR (Thwaites), LX, LXII, LXIV, LXXI. Jug. et délib., I, 511. Lettres édifiantes et curieuses escrites des missions étrangères par quelques missionnaires de la Compagnie de Jésus (30v., Paris, 1707–73; nouv. éd., 26v., Paris, 1870–83), XII, 119–211. François Élesban de Guilhermy, Ménologe de la Compagnie de Jésus . . . , assistance de France, comprenant les missions de l’Archipel de la Syrie, . . . du Canada, de la Louisiane . . . éd. [Jacques Terrien] (2 part., Paris, 1892), première partie, 511–13. F.-N. Noiseux, Liste chronologique des évêques et des prêtres tant séculiers que réguliers, employés au service de l’église . . . (Québec, 1834). Rochemonteix, Les Jésuites et la N.-F. au XVIIIe siècle, III, 641–78. C. J. Jaenen, “CHAUCHETIÈRE, CLAUDE,” in Dictionary of Canadian Biography, vol. 2, University of Toronto/Université Laval, 2003–, accessed April 20, 2019, http://www.biographi.ca/en/bio/chauchetiere_claude_2E.html.